Many a times have a been down in Little Italy and passed by this English pub surrounded by mostly Italian restaurants. Then I heard from a former coworker that this was a must visit place because of the fish and chips. I needed some de-stressing from finals on this particular trip so I brought Angie along to try out this place and of course trade our latest stories of the drama going on in our lives. Girls+food=always trading stories. So we both decided to try the fish and chips which according to the menu was “San Diego’s Best”. It was a little pricey…close to $15 for 3 pieces of battered fried cod a generous amount of fries and a small side of coleslaw. Overall the fish wasn’t too greasy, had a good flavor and crunch to it. However the fries seemed a little soggy and neither I or Angie were impressed with the coleslaw. 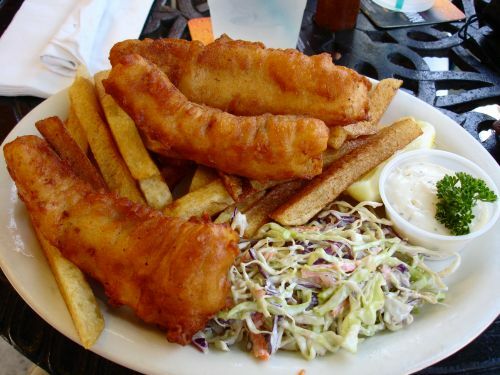 Unfortunately, Princess Pub doesn’t offer takeout boxes so make sure to bring your appetite with you.